Showing my love of peanut butter (or any nut butter) and apples, I baked up some hearty PB Apple Muffins. They’re filled with chunks of apples, delicious peanut butter, and heart healthy oatmeal. This post is sponsored in conjunction with AppleWeek . I received product samples from sponsor companies to aid in the creation of the AppleWeek recipes. All opinions are mine alone. It’s starting to get cool out. I love that. You know why I love that? Because it’s the start of oatmeal season! I love oatmeal, don’t you? It’s like stick to your ribs, sweet OR savory deliciousness in a bowl. Or a smoothie. Maybe you’re a smoothie person? I can be sometimes, but I’ve sort of gotten out of the habit. Sometimes I just want to veg after dinner and not worry about making breakfast until the next day. Yeah, I know. I could do make ahead things, but that requires me to have spare to do the make ahead things. Hello, are you new to my blog? If you are, then welcome! My life isn’t one that lends itself to lots of spare time. Just throwing that out there for ya. Anyway, Oatmeal can be made ahead of time in the slow cooker. I make a large batch of steel cut oatmeal and then package it away for work that week. I just need to grab a container out of the fridge, reheat when I get to work, and voila! I have a hearty and healthy breakfast that’s oh so delicious. Their steel cut oatmeal is leaps and BOUNDS above all others. And I can say that because I’ve been eating it WAY before it became popular like quinoa. What can I say? I’ve typically been ahead of times with that stuff. Granted not so much lately, but I have that talent and can easily tap into it again. I love the nutty flavor it has. Yes, I realize this recipe calls for their old fashioned oats. But I just wanted to tell y’all how delicious their steel cut oatmeal is. I made baked oatmeal with it last year and it was phenomenal!! Seriously. Perfectly nutty and paired well with the apples and sausage I put in there. You should check that recipe out. It’s perfect for brunch or lazy weekend mornings. Anyway, I’ve been nibbling through the instant oatmeal they sent, me, too. It has the perfect oatmeal flavor you expect and want your oatmeal to have. Don’t we all have the idea in our head of what food should taste like and you’re disappoint when it doesn’t? 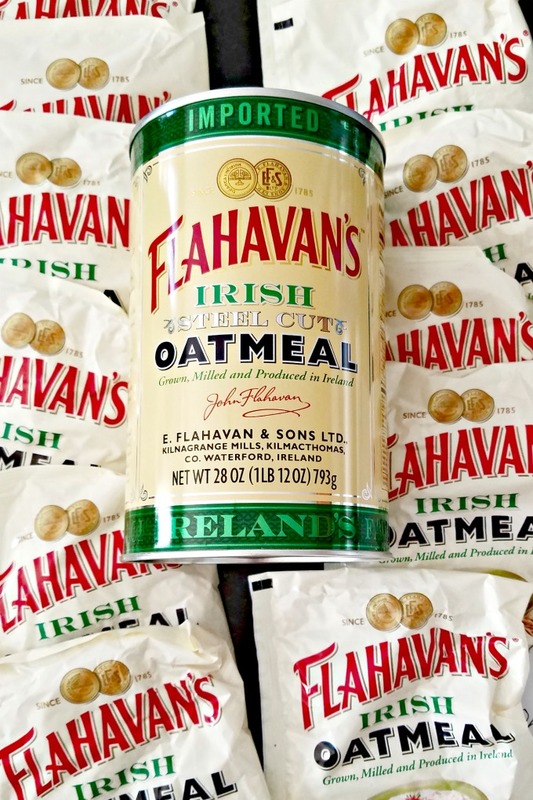 Well, you won’t be with Flahavan’s oatmeal. It really does have that perfect oatmeal flavor. Uh oh. My stomach is growling…Did you hear it? It’s a good thing I have some of these left. I might have to nibble on one before I start dinner. Or else I’ll just nibble my way through dinner and not be hungry when it’s cooked. See those chunks of apple there? And those flecks of oats? Oh yeah. That’s the stuff right there! Heart healthy fiber through and through! I can’t wait to make these PB apple muffins again!! Don’t forget to enter the giveaway! Get a head start and follow Flahavan’s on Twitter, Instagram, Facebook, and Nairn’s on Twitter, Facebook, and Instagram. Combine the flour with the baking powder, salt, and cinnamon. Add the apples and stir until they are coated in the flour mixture. Set aside. Cream the peanut butter with the brown sugar and butter until light and creamy. Stir in the eggs one at a time. Finally, stir in the vanilla and the milk. Combine the flour mixture with the peanut butter mixture until just combined. Stir in the oatmeal and allow the batter to sit for 10 minutes while you prepare the muffin tins. Line 18 muffins tins with paper wrappers. I lightly spritz mine with cooking spray to ensure the muffins come out of the paper easily. Fill the muffin cups 2/3 full and bake at 350 for 18 to 20 minutes or until a toothpick inserted in the center comes out with just a little bit of batter still on it. Cool in the muffin pans 5 minutes before moving to a wire rack to cool completely. Store up to 3 days in an airtight container in the refrigerator. Disclaimer: Thank you AppleWeek Sponsors: Swiss Diamond, Nordic Ware, Envy Apples, Imperial Sugar, The Spice House, Rodelle Vanilla, Flahavan’s Irish Oats and Nairn’s for providing the prizes free of charge. These companies also provided the bloggers with samples and product to use for AppleWeek recipes. All opinions are my own. The AppleWeek giveaway is open to U.S. residents, age 18 & up. All entries for the winner will be checked and verified. By entering you give the right to use your name and likeness. The number of entries received determines the odds of winning. Seven (7) winners will be selected. The prize packages will be sent directly from the giveaway sponsors. The AppleWeek Bloggers are not responsible for the fulfillment or delivery of the prize packages. Bloggers hosting this giveaway and their immediate family members in their household cannot enter or win the giveaway. No purchase necessary. Void where prohibited by law. This promotion is in no way sponsored, endorsed or administered by, or associated with Facebook, Instagram, Pinterest, Twitter or any other social channel mentioned in the AppleWeek posts or entry. Yum! 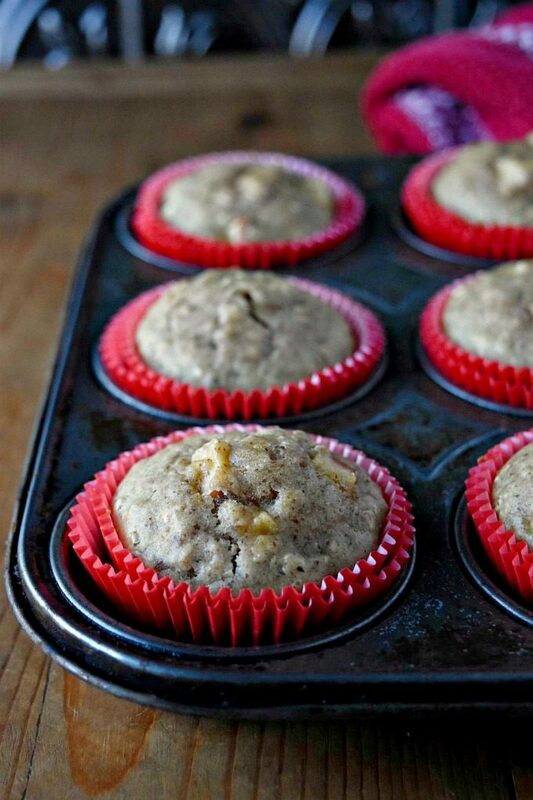 With the oats and peanut butter, this is one muffin that will keep me full all morning long! Definitely! It’s packed with lots of fiber to keep your morning energized! You have put so many of my favorite food groups into these muffins… apple, peanut butter and oatmeal are all on my list of weaknesses! They’re mine, too! That’s why I made healthy-ish muffins to hold them all. One of my favorite treats is apple slices dipped in peanut butter so I know these muffins would be right at the top of my list. That’s one of my fave snacks, too! 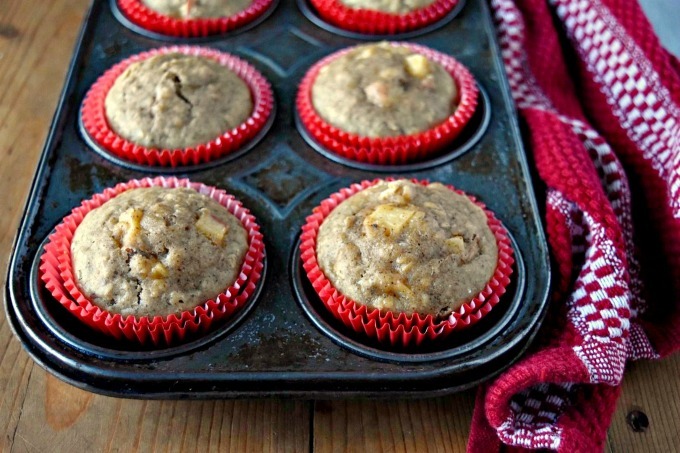 I love peanut butter and apple so these muffins are right up my alley! Ditto! It’s a fave snack for me.